Who says only the wedding couple can get hitched? Whether you’re happily married, comfortably attached or joyfully single; it’s time to make some friends and recover driving costs with GrabHitch! GrabHitch is a non-commercial social carpooling service on the Grab App that matches regular commuters heading the same way at the same time. Car owners driving to their destinations can make their car seats available to other people in exchange for a fee. Whether you’re a driver with seats to spare, or a passenger who needs a hitch, GrabHitch helps the both of you to split costs and a ride. Signing up takes less than 5 minutes! There is absolutely no additional registration involved, nor any obligation to do rides on a regular basis – you choose who to pick up and when to do so. 4. You MUST enter the referral code HITCHWED1 to get your $20 credit after you have completed your first GrabHitch ride as a GrabHitch driver! This incentive is only eligible for new drivers who sign up and successfully complete ONE ride as a Hitch driver between 16th December 2016 @ 00:00 hours –28th February 2017 @ 12:00 hours. New drivers must sign up with the referral code HITCHWED1 in order to qualify for the $20 credit incentive. The processing of the $20 cash credit incentive will only be conducted after the incentive period has ended (Post-28th February 2017). 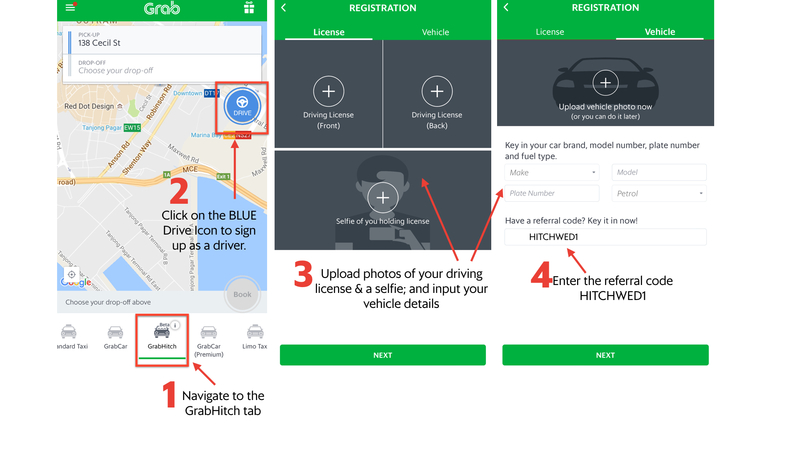 If you’re still not sure how to sign up, or have any questions regarding GrabHitch, email us at grabhitch@grab.com with the Subject: HITCHWED1 and we will get back to you in 1-3 working days.